Figure A26a. 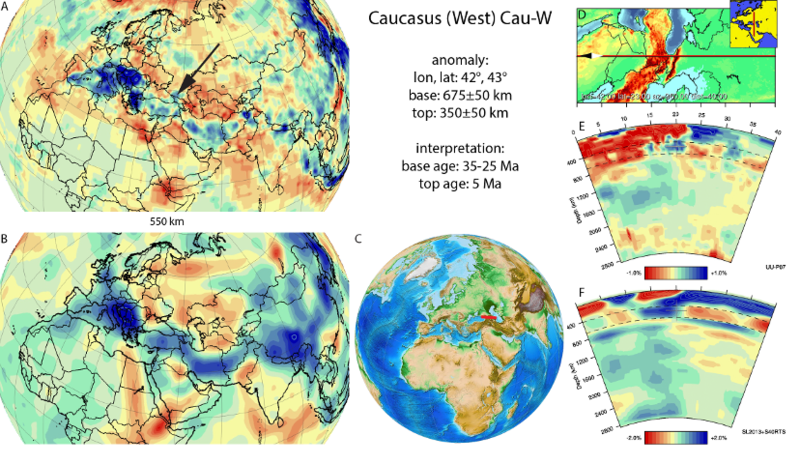 Caucasus West anomaly, interpreted as the Caucasus West slab, with (horizontal) [vertical] cross sections through (A)[D] the UUP07 p-wave) and (B)[D] the combined SL2013 and S40RTS s-wave models at 550 km; C) the location of the modern geological record that we interpret to have formed during the subduction of the slab. Tomographic images and earthquake locations have shown a complex mantle structure below the Caucasus (Figure A26a, b). The Eastern Caucasus is underlain by a northward dipping zone of seismicity with earthquakes reaching more than 150 km depth, which was interpreted to bound a 130-280 km long, northward dipping slab (Maggi and Priestley, 2005; Skolbeltsyn et al., 2014; Mumladze et al., 2015). The western Caucasus, however, does not display seismicity deeper than 50 km (Mumladze et al., 2015). Instead, seismic tomographic images show an anomaly between ~650 and 350 km depth that may represent a body of lithosphere that delaminated from the base of the western Caucasus. This was first noted in Brunet et al. (2000b), and shown for the first time in Hafkenscheid et al. (2006). Subsequently, seismic tomographic images of Zor (2008) and Koulakov et al. (2012) confirmed the location and size of this body. The onset of shortening and uplift in the Caucasus, as a proxy for the age of subduction of the base of the Caucasus anomalies, may be estimated by a first phase of denudation in Oligocene that is detected by low-temperature thermochronology (Vincent et al., 2007; 2010; Cowgill et al., 2016), at 30±5 Ma, whereby Vincent et al. (2017) showed that the older end of this age range is probably most realistic. 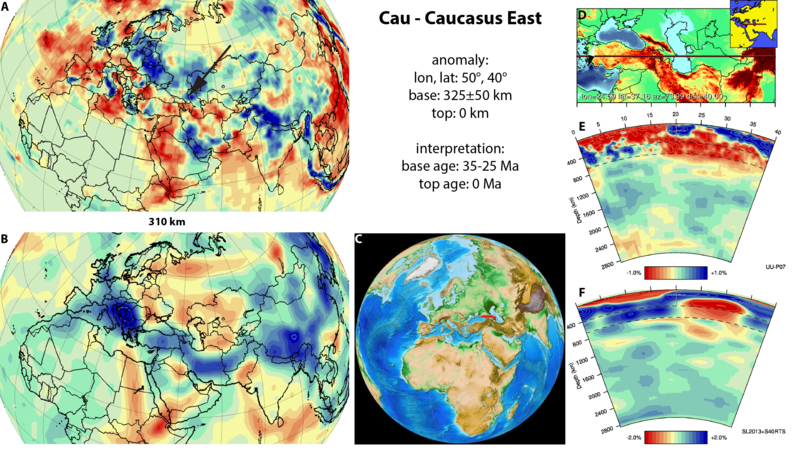 Break-off of the anomaly below the western Caucasus may coincide with the rapid phase of uplift and crustal shortening that started around 5 Ma (Forte et al., 2010; 2014; Avdeev and Niemi, 2011). Because the slab is much narrower than the elongated E-W subduction zone that existed until at least Early Cenozoic time along the southern Pontides of Turkey (e.g., Meijers et al., 2010), we consider it unlikely that the narrow western Caucasus slab is related to this subduction zone. We have not interpreted a slab of this Pontide subduction zone, but suspect that it is located within the wide anomaly below Turkey of which the southern parts are interpreted as the Cyprus, Bitlis, and Antalya slabs. Figure A26b. Caucasus East anomaly, interpreted as the Caucasus East slab, with (horizontal) [vertical] cross sections through (A)[D] the UUP07 p-wave) and (B)[D] the combined SL2013 and S40RTS s-wave models at 310 km; C) the location of the modern geological record that we interpret to have formed during the subduction of the slab. There is a cross on each graphic that indicates the midpoint of the slab, but I admit, it is somewhat difficult to see on the screen. The basal slab depth is shown as 25 km on Fig. A26b, but it appears this should be 325 km, based on data shown in Table 1 of van der Meer et al., 2018 (Tectonophysics v.723 p.309). Thanks, I corrected it corrected!